The Legal Local has long been in awe of (he might claim “despairing of”) my ability to arise early. Thus he wasn’t out the door of his house long before I was following him, out into a sunny Brussels Friday morning. Not being 100 percent oriented yet, I headed first for Flagey square, where I figured that I could follow the tram tracks to the centre of town. This proved easy enough—first up Lesbroussartstraat (I’m referring to Apple Maps while writing this, and that seems to favour the Flemish street names), then right on Avenue Louise. At this stage, getting some kind of breakfast was a priority, so I ducked into a chic sandwich bar to meet this need. A perfect opportunity to practice my French! Except that, as would often prove the case over the rest of the weekend, I managed no more than a single sentence of halting Français before the server responded in flawless English. Still, at least I got a tasty ciabatta and a chance to try the new Coke “Life” (summary – not worth the effort) for my troubles. 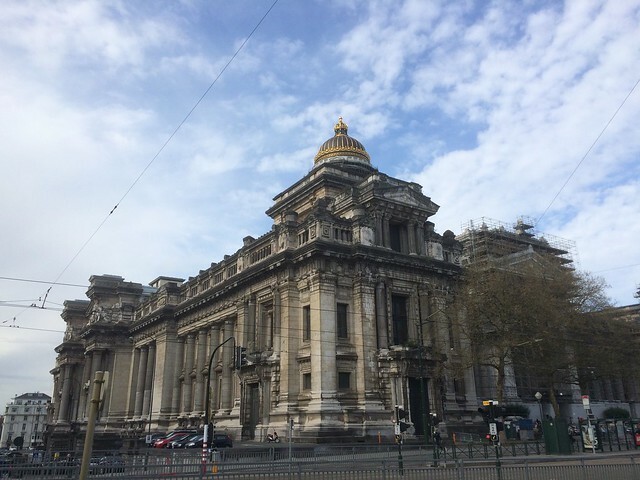 Thus fortified, I followed Avenue Louise all the way to the end, across Boulevard Waterloo to the Palais De Justice, a massive edifice unfortunately shrouded in scaffolding, above which rose its tall golden dome. There was a monument to Belgian soldiers in the world wars in the square before it, with what I thought to be the tomb of the unknown soldier below, and while there was the promise of an impressive view of Brussels to the north, it was thwarted by all the buildings that crowded in into the space just below the square. So I turned northeast instead, ducking down into alleys filled with art galleries and antique shops. The mixed-up nature of Brussels was on full view within the next few minutes. From these narrow alleys and intriguing storefronts, I turned right onto a wide street filled with boring office fronts, albeit one that was cut through by a section of the old city walls. As much as any city that I’ve ever been in, Brussels can threaten you with cultural whiplash at every turn. Reaching the Albertinaplein gardens, I was able to fix an actual destination to my random wanderings. I climbed back up to the Koudenberg, where the Musical Instruments Museum that I’d noted the day before was located. A pleasant hour or so was then spent across the museum’s three floors, aided by an audio guide that played snatches of music from instruments from around the world and throughout history. 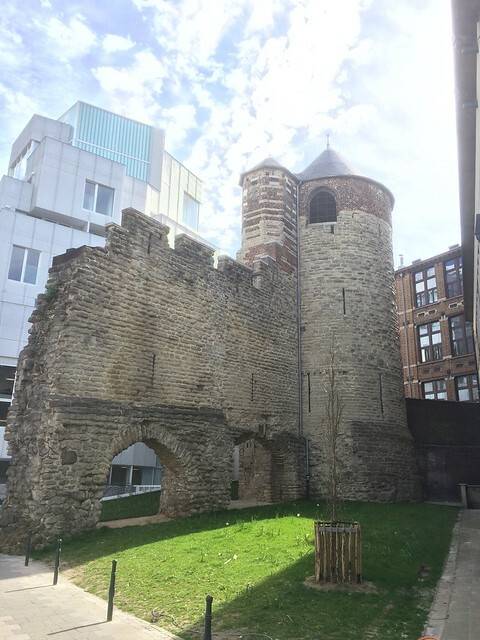 It’s not as if the Museum is the only fascinating building on one street either: just downhill are the English Pharmacie (under reconstruction) and the Hotel Ravenstein, one of the last remaining noble residences from the 15th century. Having hit my first museum though, I was aiming for another—heading all the way past the Cathedral and the National Bank to the Belgian Centre for Comic Strip Art. Celebrating the ecosystem of Bandes Dessines, authors and artists who emerged throughout the 20th century in Belgium and across Europe (there was some mention of the early pioneers in the U.S. but little more recent than that), it’s an open, airy space inside a custom-built art deco building. The main exhibits were nicely laid out for wandering through and had plenty of English text, but for the special exhibit, relating to the long-running “Thorgal” series, I had to rely on my French to understand what was being shown. The art, though, was amazing, and it certainly encouraged me to try out more European comics in the future. Next up, I circled the Cathedral again and found myself heading north on the Koningstraat, which seemed to be taking me away from the city centre. I did however manage to find the actual Tomb of the Unknown Soldier, but as soon as Koningstraat met the Boulevard Waterloo. I didn’t mean to stay on the massive ring road for long though, and I soon ducked away to the east, down into narrower streets and steeper hills. This area was more or less a city within a city—the home of the European Commission and the European Parliament—and eventually I made my way through it to the Wetstraat, which led me up to the Parc du Cinquantenaire. Amid the greenery and in the sunshine, I settled in for a late lunch of pastries, fruit and water. The simple life. The plan was to meet the Legal Local once he emerged from work, but I did have a couple of hours to kill before that, and one more museum to check off my list. So I headed through the park to Belliardstraat and from thence through Parc Leopold to Place Jourdan again. From thence I took myself uphill to the Dinosaur Museum of recent memory. Now, the Dinosaur Museum is actually the Museum of Natural Sciences, but when a herd’s worth of Iguanodons is found in a local coal mine, then you build a museum around them and sell the crap out of it. 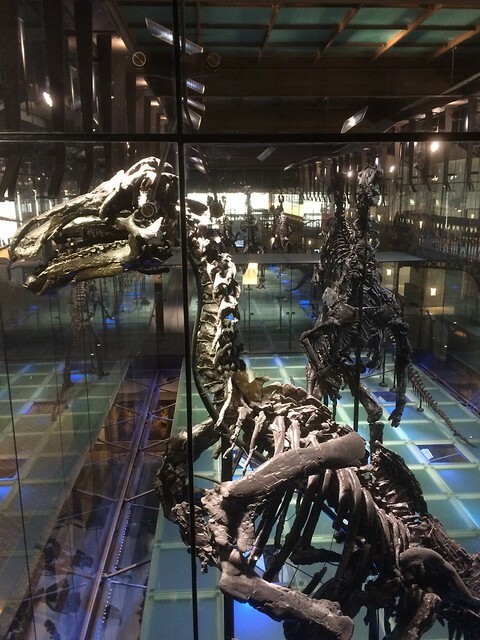 Thus the entire rest of natural history has been shunted into the smaller wings, while the Iguanodons and their dinosaur relatives have pride of place in a massive gallery festooned with interactive exhibits. As with the Comic Arts Museum, English script only really features on the main exhibits, but my French had lost enough of its rust for me to get by, as long as I was willing to skip over the trickier words. Shortness of time eventually drove me from the company of the dinosaurs, and I headed south towards Ixelles, Flagey and my temporary abode. I arrived back not long before the Legal Local, who was very happy to ditch the suit and tie of his day job for something more appropriate to a Friday evening. Putting myself in his hands, I headed out for food (an epic burger, which was a clever choice considering what came later) and an early beer in a great little pub full of gaming paraphernalia. 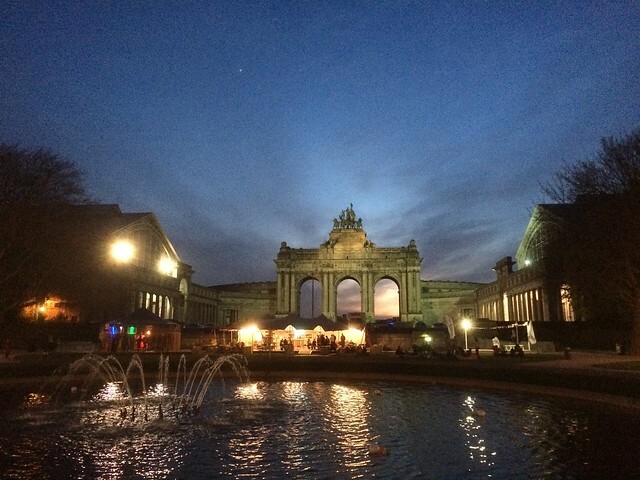 Once we were suitably fortified, we headed back to Parc du Cinquanteniere, where we met with a friend of his and headed for a rendezvous with several others. It was getting a bit chilly there though—we were at least a month early for proper summer night escapades—so instead we took ourselves to the Old Oak, one of the more Anglo-centric locations around town. That saw a few more beers for us, meeting up with the Legal Local’s friend again before heading back to Flagey for more drinks with another of his friends in De Valera’s (yes, an Irish bar). Beyond that, well, the evening isn’t too well remembered. There was at least one more bar and possibly two, out beyond Avenue Louise. The kind of bar you just don’t really get in Dublin any more, reeking of cigarette smoke. I had a hell of a night, and I didn’t emerge from it until dawn was rising. …that Day Three was a bit … inactive. I woke up around 1pm and promptly went back to sleep again until 5. To his unending credit, the Legal Local refrained from mockery, he having skipped out before things truly went down the rabbit hole. Once I was able, we headed out into the narrow streets near Flagey to one of the places that he’d identified in his 18 months in town—a pizzeria that fed and watered both of us, restoring humanity if not quite relieving the exhaustion I was feeling. Now fed, we grabbed some more nutrition from a nearby shop and returned home for a restful evening indoors. After all, we would actually have to do things the next day.